On our last visit to Istanbul we finally got to return to this famous neighbourhood – we’ve wanted to return to Ortaköy since pre-blog days and could have gone back earlier if we’d so wished, but we just figured everything might as well be in place when we did go back. You see, since Istanbul was the European Capital of Culture back in 2010, many of the city’s most famous buildings have had – and are still having – pretty hefty face lifts. You may remember our frustration that Süleymaniye Camii in Beyazıt was out of action for a period (sections of its surrounding complex are still under renovation) and, by and by, Ortaköy Mosque (or Büyük Mecidiye Camii, to give it its proper name) also disappeared under scaffolding and a green veil of mesh…and there it stayed for an achingly long time. 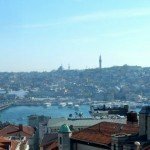 You can see the mosque, here, poking out from its hiding place as we ran across the Bosphorus Bridge in 2013. Would it ever be finished…? Yeah, of course it would – eventually – and now, if you visit Ortaköy, you can see this little Beşiktaş neighbourhood in its full glory. You make the effort to go to Ortaköy because it’s along the shore of the Bosphorus, you’re up close and personal with the Bosphorus Bridge, it’s a place to see and be seen, the air is fresh and breezy…you go to Ortaköy for lots of other reasons, too, but that’s not what this post is about. Ortaköy is where you come to enjoy all of those sights and sounds…whilst you’re negotiating your way through Ortaköy kumpir! Kumpir is a baked potato – and what’s so exciting about a baked potato, you’re probably thinking? But didn’t we just say kumpir was slightly peculiar when it comes to Turkish street food? Well, that’s because it’s not so much about the baked potato as the filling(s) that squash and pile and grapple with each other on the inside. Kumpir is that food where you throw caution to the wind, let loose and question nothing – you pile those fillings in. And when it comes to kumpir, Ortaköy is the daddy of all places for indulging in this famous dish – and it’s where you’re positively encouraged to pile as much filling in as possible, whether you think the ingredients go well together or not! Get ’em in there! A huge potato is lifted from the oven, placed into a tray and then cut in half lengthways. Butter and grated cheese are then mashed into the fluffy potato, one hand turning the potato whilst the other mashes continually with a knife. This is your kumpir base and the process will take a minute or so while they make sure the potato, cheese and butter mixture is smooth. Mixing and mashing completed, your potato is then slid along the counter to your next person who looks at you with anticipation. It’s time for you to choose your fillings! But we’re letting loose, remember, and your guy or lady will be stood there, spoon in hand, waiting to start stockpiling goods into the creamy potato base. No need to worry if you don’t speak Turkish. Pointing is good enough, here. Is that it? Noooo, because now, even as you look at your kumpir and wonder how on earth you’re gonna even begin to negotiate your way through that heaped jumble of colour, texture and flavour, you’ll be asked if you want ketchup, mayonnaise. Really? Do you really want ketchup and mayonnaise squirted over the top of all that? Lots of people do, yeah…we don’t. Your tray is wrapped in foil and there you have it. 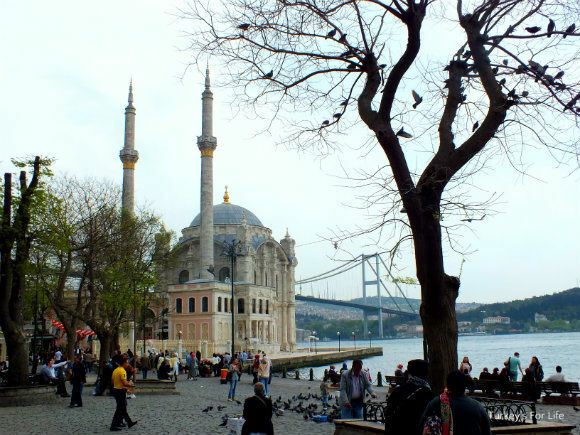 And what more perfect surroundings for enjoying your kumpir – Ortaköy with its famous mosque and Bosphorus setting. Now you can amble around this little area with your plastic fork and stock-piled tray of mixed goodies all piled into your potato – and you won’t look at all silly or greedy because most other people will be doing exactly the same as you are. It’s also likely they’ll be thinking the same as you, too. Whilst it is possible to amble around and eat your kumpir, a seat really does come in handy. Spy your chance and grab a bench by the Bosphorus…or just do what we do and park yourself on a wall, somewhere. Sitting down gives you time to decide your order of eating – one filling at a time or just delve straight in there and mix and match? 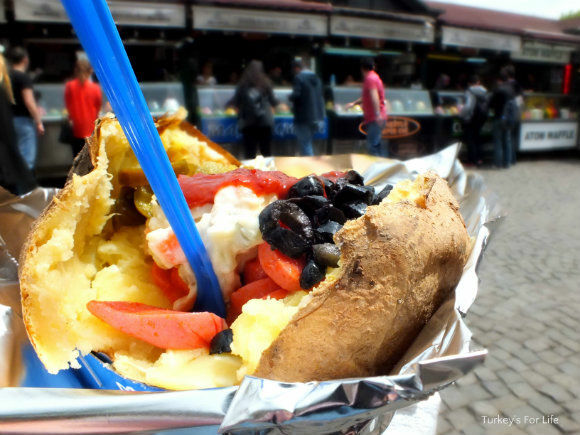 That’s the fun of Ortaköy kumpir, and, most importantly, it’s not just a street food party in a potato; it’s delicious, too! Like we said above, you can get kumpir all over the place in Turkey; it’s just that we love to save this particular street food for our jaunts to Istanbul. We do love baked potato, however, so we make our own – slightly more tame – twice-baked kumpir at home quite often. 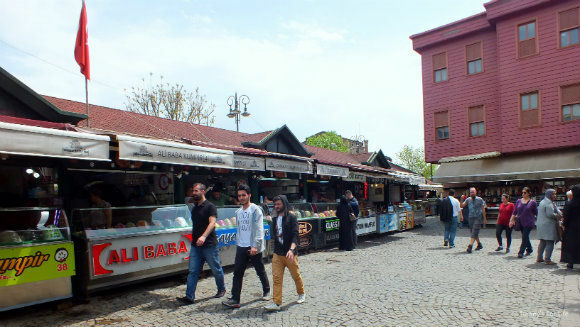 Ortaköy is in the Beşiktaş area of Istanbul. If you’re staying in Sultanahmet or Beyoğlu, you can take the metro as far as the last stop to Kabataş, past Dolmabahçe Palace, and it’s around 10-15 minutes’ walk further along. There are buses (or take a taxi) that go all the way to Ortaköy but the traffic is often slower than walking pace along that section of road and it’s a pleasant tree-lined walk, anyway. The amount of fillings you accept is irrelevant. Kumpir is one set price (15 TL spring 2015) so no need to worry about the price mounting up as more fillings are added. Oh No, we didn’t see these when we were in Istanbul. That’s it… we’ll have to return. My husband is a waffle freak too so Ortaköy will be the place for us. Im from tunisia, im looking for a turkish busniss men to open the best kumpir in tunisia, who can help me with turkish chef in kumpir to open with me?? ?